Well, we survived the World Cup. It was a long haul with some rough moments, but we survived to see Germany triumph over Argentina, which my husband rather enjoyed. There’s only one problem. We now have a ton of leftover, obscure booze from around the world. Wait, is that a problem? Let’s look at it as an opportunity. Today, we’re going to use up some cachaca, which is a Brazilian rum. When we tried it, we thought it tasted more like tequila than rum. It has that sharp sweetness you sometimes get from tequila. 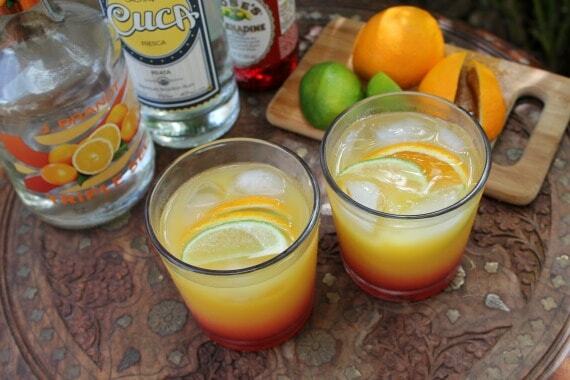 Geoff had the great idea to make a Brazilian version of my favorite tequila cocktail, the tequila sunrise. 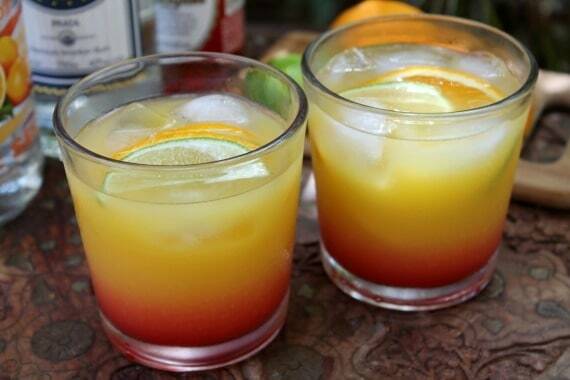 I combined cachaca with triple sec, and orange juice, then layered in some grenadine for that lovely sunrise effect. I garnished them with thin slices of orange and lime. The tart citrus compliments the sharpness of the cachaca. I’m into it. I still feel a little sad for the way Brazil’s World Cup ended. But with the Summer Olympics in Rio in two years, I’m sure we’ll be buying another bottle of cachaca. Now what am I going to do with all this Amarula and Wishniak? I see lots of international cocktails in our future. Come on over. Put a handful of ice in a short glass. Add cachaca and triple sec. Fill the glass most of the way with orange juice, then stir. Tilt your glass slightly to the side and slowly pour the grenadine down the inside of the glass so that it can make a lovely pink layer on the bottom. 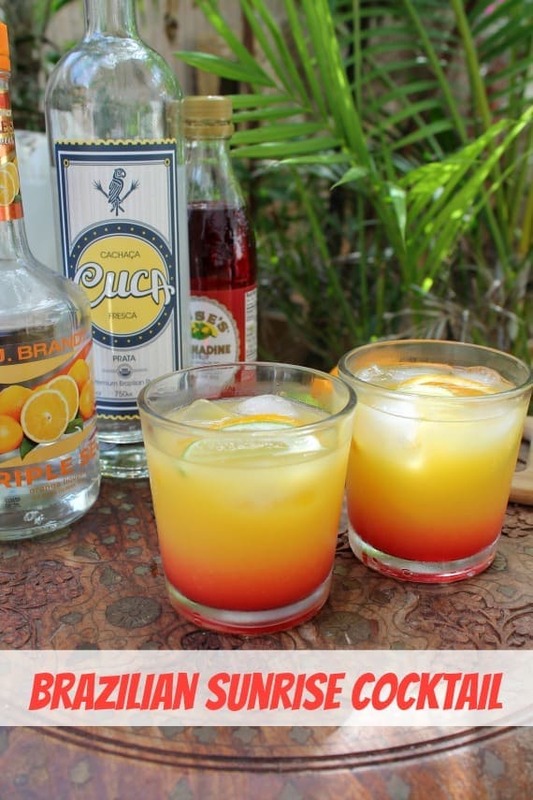 Add orange and lime slices and celebrate Brazilian style. I’m going to have to learn how to layer drinks. Just pour slowly. It all depends on the viscosity of the different ingredients. Grenadine is perfect for layering because it’s really thick.